La Jolla, CA – A collaboration between researchers at the Salk Institute for Biological Studies and the University of California at Los Angeles captured the genome-wide DNA methylation pattern of the plant Arabidopsis thaliana – the “laboratory rat” of the plant world – in one big sweep. 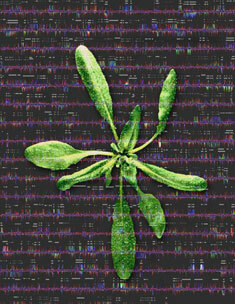 The Arabidopsis rosette sits on a map of transcripts that are expressed in various Arabidopsis mutants unable to modify their DNA through a process called methylation. Many hundreds of the transcripts were previously unknown and were found to originate in the intergenic dark matter. These technological innovations, pioneered by Ecker’s team and that of Steve Jacobsen, Ph.D., a Howard Hughes Medical Institute investigator at UCLA, should have broad impact on the analysis of the human genome, stem cell biology and therapeutic cloning. Their findings will appear in a forthcoming issue of Cell. Our view of heredity has largely been written in the language of DNA, but recent discoveries in a field known as epigenetics – the study of heritable changes in gene function that occur without changing the letters of the DNA alphabet – show that how a cell “reads” those letters is critical. Methylation is chemical modification of one letter C (cytosine) of the four letters (A, G, C, and T) reiterated in our DNA. Adding a bulky methyl group to a C often blocks interaction with proteins required to activate gene expression, effectively silencing the methylated gene. Ecker and Jacobsen were funded by the National Human Genome Research Institute (NHGRI), which launched a public consortium known as ENCODE, for the Encyclopedia Of DNA Elements. Now that the human genome has been sequenced, ENCODE aims to develop technology to decipher what 30 million (1%) of those letters “spell” by identifying not only what genes they encode, but how epigenetic modifications switch genes off and on. Once that’s achieved, the effort will be scaled up to learn more about the dynamics of the whole human genome. Each microarray or DNA chip is dotted with 6 million short DNA fragments that span the Arabidopsis genome like floor tiles. The researchers first isolated all methylated DNA from plant cells and located where those fragments fell on the array. Then they determined which genes were active and which ones weren’t in order to compare gene activation with the methylation pattern. The investigators saw significant changes when they compared activity of genes in normal plants with gene activity in plant mutants unable to methylate DNA. “It was pretty dramatic. There are hundreds of genes that you never see expressed except in methylation mutants,” says Ecker. Almost a third of Arabidopsis‘ ~ 26,000 genes were methylated in some manner, and where they were methylated determined the effect. As in mammals, methylation in regulatory regions next to genes generally silenced genes. However, methylation across the body of a gene appeared to correlate with higher expression. Different cell types show different methylation patterns. DNA methylation in stem cells differs from that in a mature skin or nerve cell. Part of the makeover mature cells must undergo for therapeutic cloning purposes will likely involve remodeling methylation patterns to resemble those of stem cells. And disease states, ranging from retardation to cancer, are marked by aberrant methylation: some carcinogens cause cancer by methylating the “wrong” genes, leading to uncontrolled growth. Once a cell’s DNA methylation pattern – be it normal or pathological – is established, methylated sites are faithfully inherited by daughter cells. The ability to take a high-resolution snapshot of what genes are methylated and which ones aren’t during different developmental or disease states might show how cells self-renew or growth control genes become de-regulated. The investigators also found that methylation silences transposons, so-called “jumping genes,” which can wreak genomic havoc by hopping about the chromosomes. In the words of Ecker, undermethylated transposons “just go wild,” suggesting that mother nature keeps transposons in time-out by covering them with methyl groups. In addition to funding from NHGRI, this work was also supported by the National Science Foundation’s Arabidopsis 2010 Project – an effort to identify functions for all Arabidopsis genes. Other authors contributing to the study include Salk investigators Junshi Yazaki, Ph.D., a postdoctoral researcher, graduate student Ambika Sundaresan, and research associates Paul Shinn and Huaming Chen. Other collaborators at UCLA include assistant professor Matteo Pellegrini, Ph.D., postdoctoral researchers Xiaoyu Zhang, Ph.D., Ian Henderson, Ph.D., and Simon Chan, Ph.D., and research assistant Shawn Cokus.